Haq's Musings: When Ayub Met JFK 50 Years Ago.. I was a little child growing up in Karachi when the news of JFK's assassination was received with great shock and extreme sorrow in Pakistan. That was 50 years ago today. Just a couple years earlier in 1961, Pakistan's President Mohammad Ayub Khan had made a successful state visit to the United States. He was warmly received at Andrews Air Force Base near Washington DC by US President John F. Kennedy and First Lady Mrs. Jacqueline Kennedy. I saw the pictures of President Ayub Khan meeting with the US President John F. Kennedy as did other Pakistanis. There were also many photographs of young JFK and his beautiful family splashed across the front pages of major Pakistani newspapers during and after the visit. 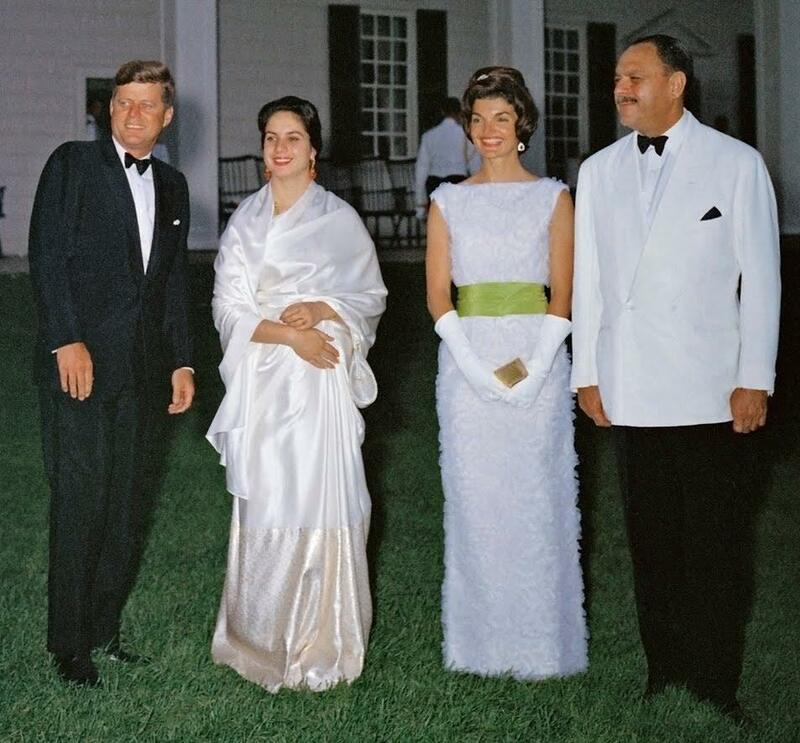 The sudden loss of the young American president in 1963 was deeply felt as Pakistanis viewed images of his beautiful young widow and two little children mourning for their loved one at his funeral. US-Pakistan ties were extremely close in 1960s. 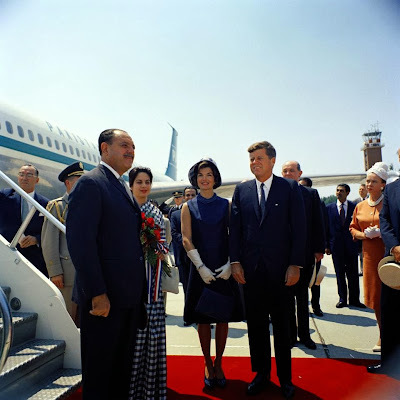 President Ayub was extended the rare honor of being welcomed by the US President and the First Lady at the airport when the PIA airplane carrying him landed in the United States. He was also given the privilege of addressing a special Joint Session of the US Congress where he received standing ovation. Later, he rode an open top car in a ticker-tape parade in New York City with tens of thousands of Americans lining the parade route and cheering him. US followed up the visit with a massive assistance program which helped bring about the Green Revolution in Pakistan. The world's largest continuous irrigation system was built along with huge dams with US aid in 1960s. In addition, there was a major industrialization program started under state-owned Pakistan Industrial Development Corporation (PIDC) with US help. The decade of 1960s is called by economists as Pakistan's Golden Sixties. It was the result of good governance and significant help from the United States at the height of Cold War. Both US and Pakistan still have close ties but these are marked by significant mutual distrust. People of goodwill on both sides can help reduce some of this mistrust to improve relations. President Kennedy said in his 1961 inaugural address: "Ask not what your country can do for you; ask what you can do for your country". It is still as applicable to both US and Pakistan today as it was when he said it. 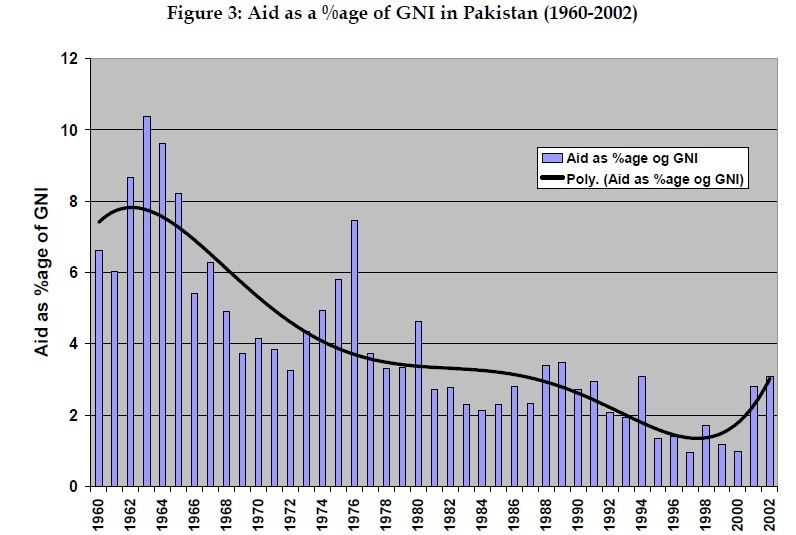 What about aid as %age of GNI in Pakistan data for period of 2002-2012 ? Could you please share that data as well ? not bad but India managed to do the same with BOTH the US and the USSR at the height of the cold war. Pakistan's 'extremely close' relations didn't stop the US from putting sanctions in 1965 and then in 1971 when US help was needed the most.Or stop the US from giving many times as much and arguably better aid(helping set up IIT Kanpur ,Heavy industrial plants,Nuclear reactors etc) to India. Lets face it diplomatically speaking the Indian diplomatic corps eats their Pakistani counterpart for breakfast! Shiraz: "What about aid as %age of GNI in Pakistan data for period of 2002-2012 ? Could you please share that data as well ?" US aid less than 1% of Pakistan's GDP in the period since 911 vs 8% during 1960s. Anon: "not bad but India managed to do the same with BOTH the US and the USSR at the height of the cold war." Pakistan's economy grew at or above 7-8% vs India economy's "Hindu growth rate" of 2-3% in those years. Recent growth spurt in India owes itself mainly to the massive FDI flow from the West and growing trade with the West after the end of Cold War. others who are giving us such a low level of help. for instance, if someone told me that he would give me and my family aid equivalent to 10% of our current family income on the condition that he be allowed to dictate, to some extent, what we do --- i would tell him to go to hell! why doesn't pakistan do this? Roland: "why doesn't pakistan do this?" I wrote a post on this very subject titled: "Take This Aid and Shove it". Although refusing US aid will hurt the anti-poverty efforts, higher education and infrastructure development programs to some extent unless made up by raising greater tax revenues to replace it, it is theoretically possible to say No to the US aid without a big negative short-term impact on Pakistan's economy. However, Pakistan would be well advised to not seek confrontation with Washington even after refusing US aid. Why? The reason is simply that the United States is the architect and the unquestioned leader of the international order that emerged after the WW II and this system still remains largely intact. Not only is the US currency the main reserve and trade currency of the world, the US also dominates world institutions like the UN and its agencies, the World Bank, the International Monetary Fund (IMF) and the World Trade Organization (WTO). 2. They must save more, a lot more than the current 10% of GDP, to have more money for investment in the future. 3. They must spend more on education and heath care and human development to develop the workforce for the 21st century. 4. They must invest in the necessary infrastructure in terms of energy, water, sanitation, communications, roads, ports, rail networks, etc, to enable serious industrial and trade development. 5. They must develop industries and offer higher value products and services for exports to earn the US dollars and Euros to buy what they need from the world without getting into debt as the Chinese have done. ^^RH: "Rather than alienate the United States and risk being subjected to international isolation and crippling sanctions like North Korea (a Chinese ally), Pakistanis must swallow their pride now and choose better ways of becoming more self-reliant in the long run." Iran has been under US sanctions since 1979. Why have they not been "crippled"? Looks like Iran did just as well as we did, despite having suffered a million dead from the 10-year war with Iraq, and did so under severe US sanctions. In fact, they just put a small satellite into space on their own, which is way ahead of the balloons and kites that SUPARCO is still fiddling around with. HWJ: "Iran has been under US sanctions since 1979. Why have they not been "crippled"?" Iran's economy and income are a function of oil price which has soared since 1979. Iran is among the fastest shrinking economies today. They are in a heap of trouble forcing them to the table to agree to freeze their nuclear program. Pakistan would be foolish to emulate Iran.